But what Sox player David “Big Papi” Ortiz did last night was indefensible and Sox fans need to be the first to rally and call for harsh penalties against him. I was at a wedding last night so I didn’t catch the game, but I caught a video of it this morning. The Sox were playing the Baltimore Orioles in Baltimore and had a solid 7 to 2 lead in the top of the seventh inning when Ortiz, the Sox’s designated hitter, came to bat. Papi’s having an exceptionally good year and is a team leader and role model. 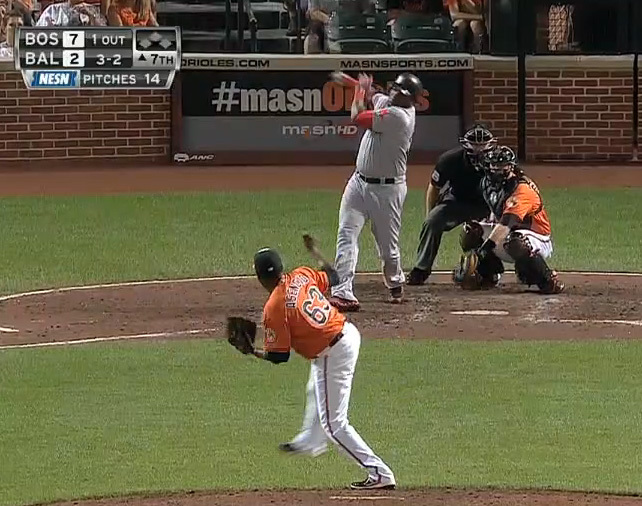 Ortiz had a 3-0 count going, when umpire Tim Timmons called the next pitch a strike. 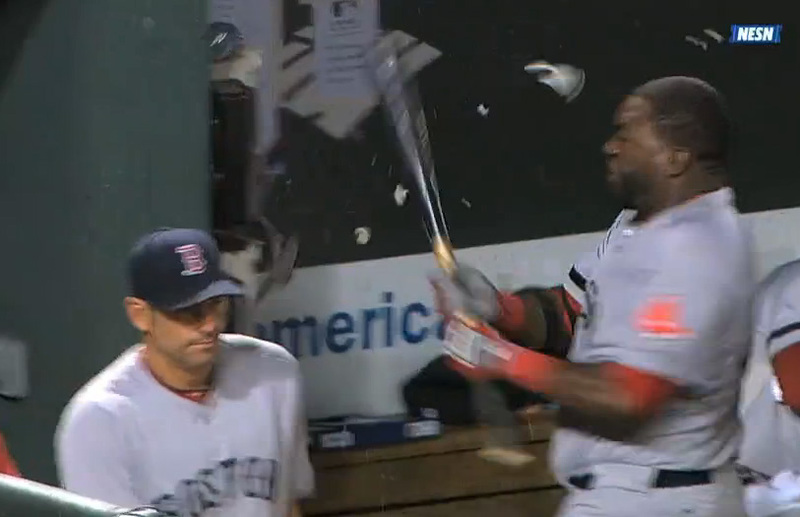 Ortiz expected to walk and objected to the call, and eventually struck out swinging at a ball as high as his ankles. 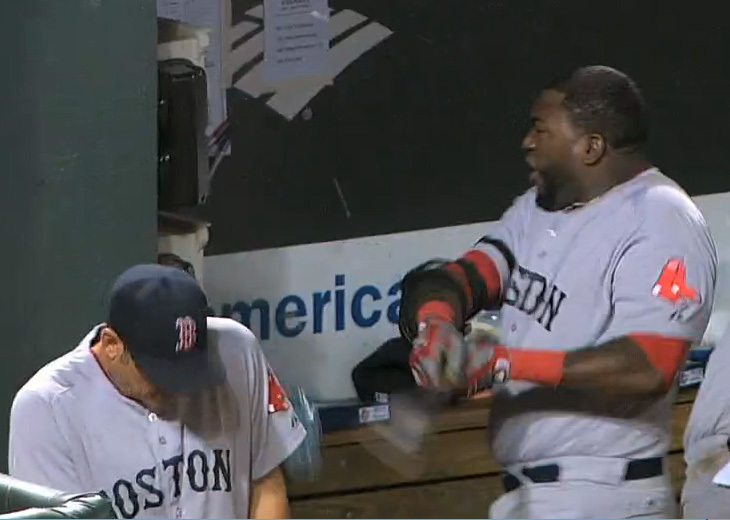 Still agitated from the first strike call, Papi gave a mock salute to the umpire showing he felt the ball was too high. That one action alone could have easily had him ejected from the game. In fact, Red Sox announcers Jerry Remy and Don Orsillo were surprised he wasn’t ejected. Players aren’t supposed to argue balls and strikes with umpires, let alone insult them. 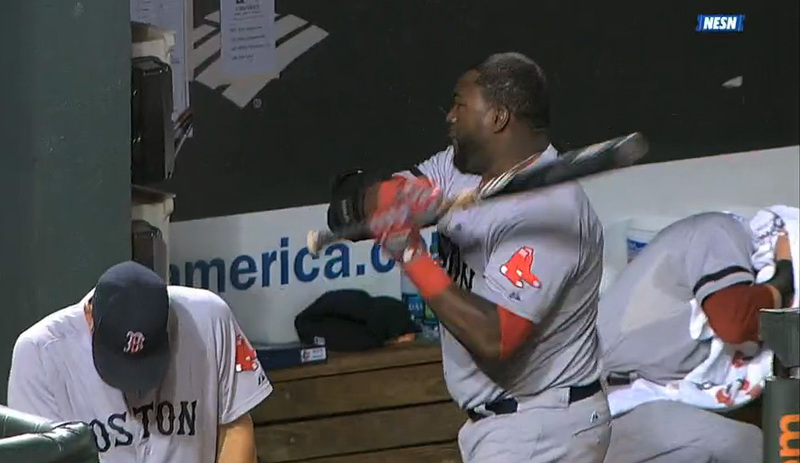 So Papi seemed to catch a break, but only momentarily. Enraged, he started mouthing off and throwing a temper tantrum so the umpire did eject him from the game. 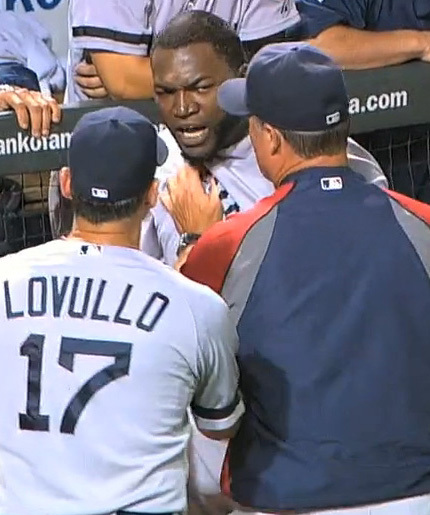 Although Sox Manager John Farrell and other players tried to calm him down, Ortiz was out of control. He grabbed a bat and angrily smashed a dugout telephone, narrowly missing two players in the process. In an interview following the game, Ortiz acknowledged his outburst but said he was justifiably angry at the umpire’s call. Farrell said he doesn’t think Ortiz’s actions warrant a suspension. Wrong. Wrong. Wrong. John, let’s review the tape. What we see is MUCH more than a mere temper tantrum. David Ortiz showed HUGE disrespect for the umpire, BEFORE the “controversial” pitch was even thrown. He didn’t stand properly at the plate. He only had one hand on the bat. Conduct unbecoming and unprofessional. He was EXPECTING a ball. Such a narcissist, I guess he was thinking that if he willed it to be a ball, it would be a ball. It had to be a ball. He’s Big Papi, and if he wants Ball Four, he will GET Ball Four. Then, he put teammates in harm’s way. He nearly hit two of them wildly swinging a bat. Plus he damaged property. Let’s assume the umpire was blind and missed the call and the pitch was too high and should have been called a ball. How many freaking times has a call gone in Papi’s favor? How many times has a strike been called a ball? It happens. Umpires are humans and make mistakes. You get some calls in your favor and some against you. It’s the name of the game. Pros let these things go, like water off a duck’s back, and move forward. David Ortiz has crossed the line and should be suspended for his actions. I’m a Red Sox fan, and a David Ortiz fan, but I’m also a baseball fan, and what’s wrong is wrong, and this was scary wrong. He deserves an equitable punishment in the name of the game. 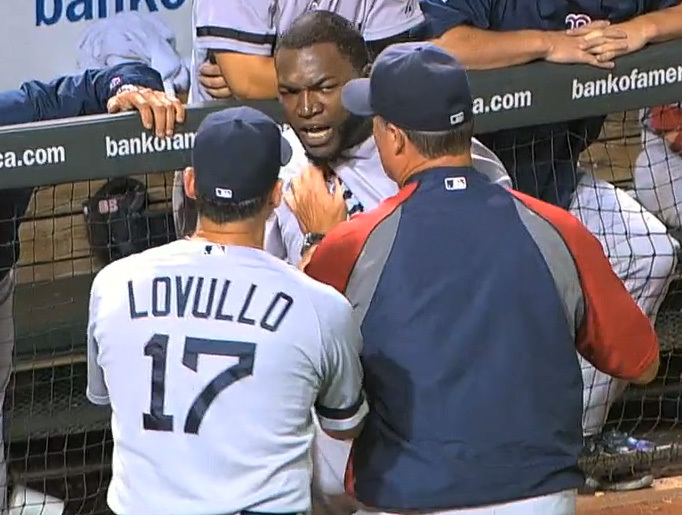 Here is “an anatomy” of Ortiz’s outburst, followed by a video clip of the incident. What do you think? 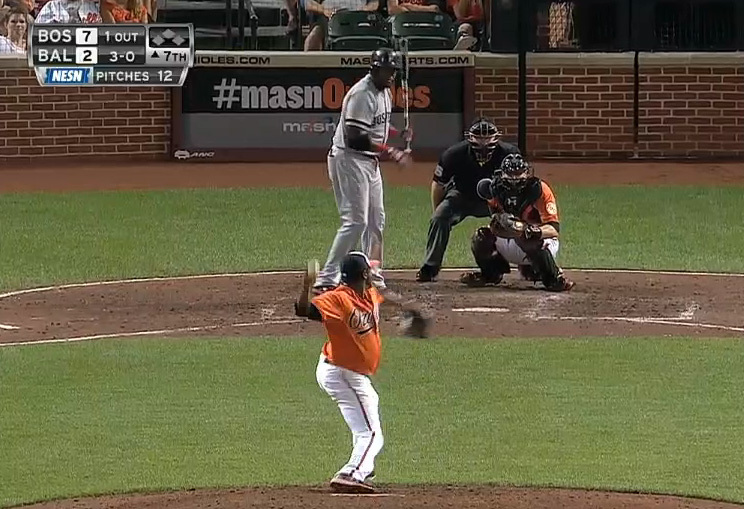 PHOTO#1 David Ortiz at bat as the “controversial” pitch is thrown. Look at how he is standing. He isn’t even holding the bat with two hands. He clearly wasn’t even going to swing. 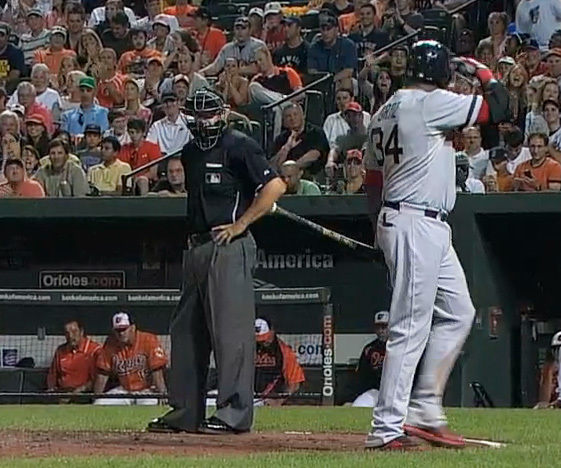 An arrogant insult to the pitcher and umpire to stand that way. PHOTO#2 As the catcher catches the “controversial” pitch, Ortiz already had his bat down and was moving away from the plate. He was clearly EXPECTING ball four. Like he KNEW the pitcher was going to throw a ball. 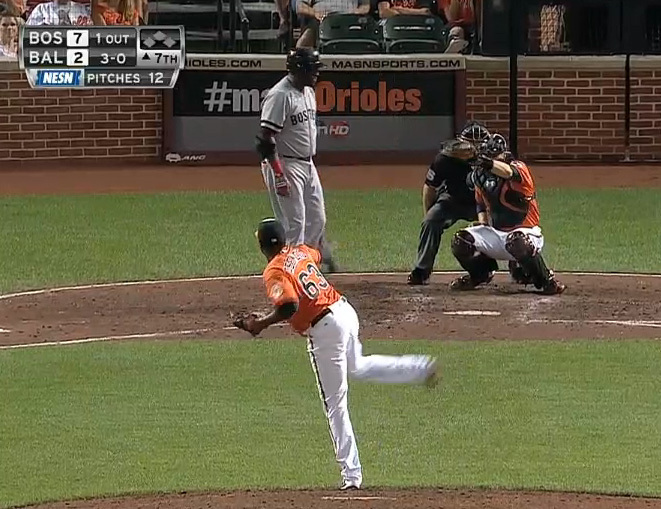 PHOTO#3 Ortiz strikes out. Swinging. His fault, not the umpire’s call! Look at the catcher’s mitt. He swang at a ball as low as his ankles. HIS choice. PHOTO#4 Oritz rudely gestures to the umpire. He should have been ejected right then and there. But the umpire gave him a break. 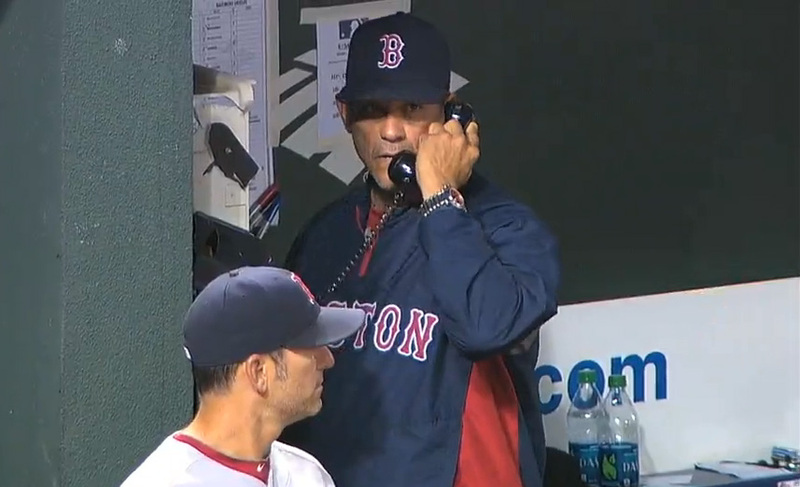 PHOTO#5 Manager John Farrell tries to calm the “raging bull” but to no avail. PHOTO#6 Oritz takes a bat to the dugout’s telephone. PHOTO#7 As he smashes the phone, his bat comes perilously close to a teammate who cowers. PHOTO#8 Dustin Pedroia, right, also protects himself from flying debris. PHOTO#9 Amazingly, the phone still worked. Perhaps this guy’s calling 911 to report an Assault and Batter-y. I’ve embedded the entire video from MLB.com, click on the picture below to see it. u call yourself a red sox fan? you are missing 2 Key aspects. Papi was calling for time 3-0 and it was not granted, thats why he was standing like that. its not slowpitch softball big leaguers dont do that. Secondly you totally left out that after the delayed strike call and papi tossing his bat because it was CLEARLY a ball the umpire definitely said something to Ortiz. idk what but something was said. Then 3-1 there was a another pitch thrown (an inch or 2 off the plate) and again a delayed strike call. Then was the swing and miss which he had no choice but to swing at. The point of this whole article should be the power hungry umpires who escalate these situations by barking back at players, not a guy who got screwed over and lost his cool because of it. Thanks for your comment Bill, and for pointing out more of what went on with that at bat between Papi and the umpire. Knowing how seriously Papi takes his game (and for the record I wear my Ortiz jersey to all the Sox games I go to, home and away, especially Yankee Stadium) I believe he did find fault with the umpire’s call, and as you alluded too, maybe even more went on between them. Does that call for taking a bat to a telephone within inches of your teammates? That’s behavior by a guy that’s seriously out of control. I don’t know if his personal life is getting to him as well. But he can’t keep doing this kind of stuff. The next day he channeled his frustrations into amazing batting. That’s the best revenge. That’s the Papi I admire. Cheers.